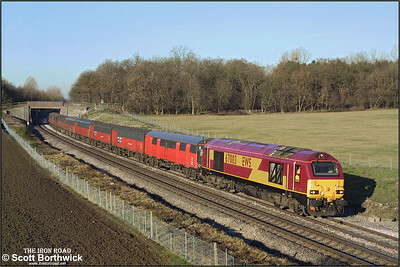 67003 sweeps past Besford with 1V53 0727 Low Fell RMT-Bristol Parkway RMT on 12/12/2001. 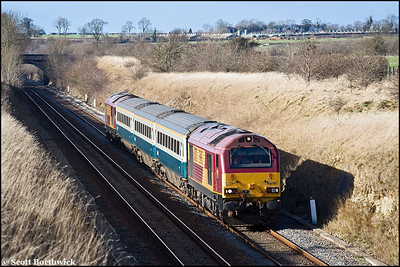 This service was an extra for Christmas mail. 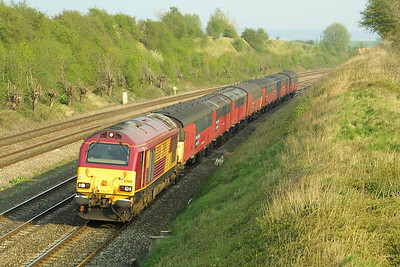 67030 is pictured on the Down Main in South Moreton Cutting on 10/04/2002 whilst working 5C37 1355 WO Old Oak Common-Bristol Barton Hill. 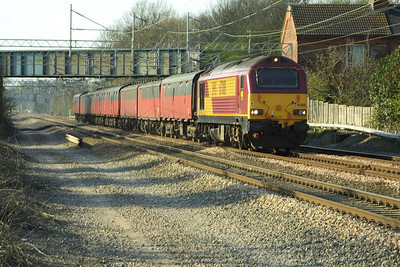 The train conveyed mail vans returning to traffic after repair at Old Oak Common T&RSMD. 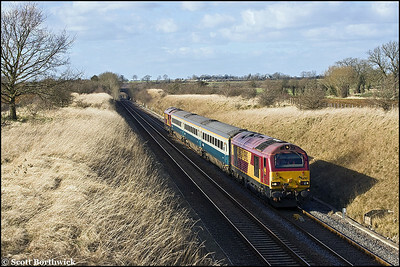 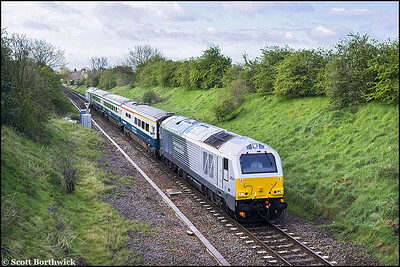 67028 speeds along the Down Main in South Moreton Cutting with 1V33 1558 Willesden PRDC-Plymouth mails on 10/04/2002. 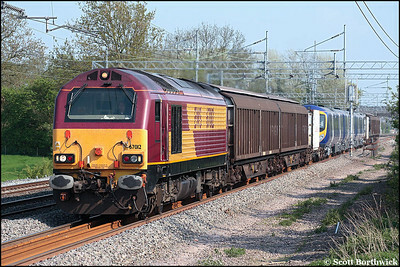 Diagrammed for an EWS 90, 67008 made an unusual appearance at the head of 1A90 1532 SX Warrington RMT-Willesden PRDC when pictured at Cathiron on Tuesday 8th April 2003. 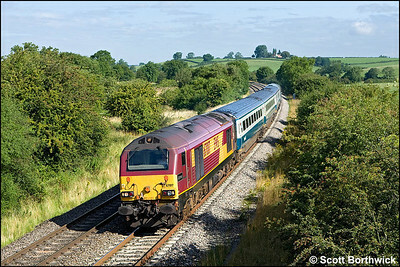 67003 speeds past North Stafford Jnct on 24/07/2004 with 1V15 0708 SO York-Paignton. 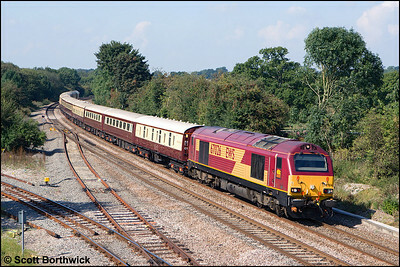 Royal Train liveried 67005 attempts to make up time as it speeds past North Stafford Jnct on 24/07/2004 with 1E99 0905 SO Paignton-Newcastle. 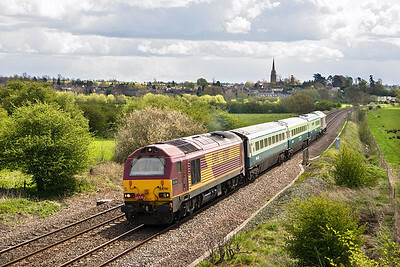 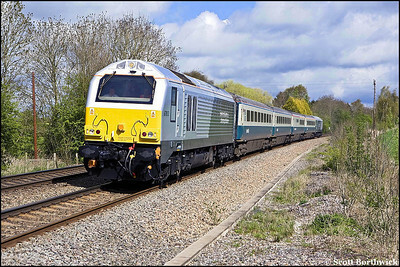 The train had been held for thirty minutes at Bristol Temple Meads awaiting the arrival of 1E32 0802 Penzance-Newcastle in order that passengers could transfer trains due to 1E32 (a four car voyager) being 'full and standing'. 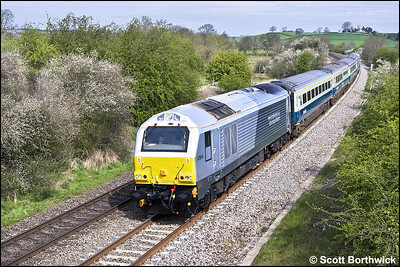 Oh for the mass re-intoduction of proper trains !!!! 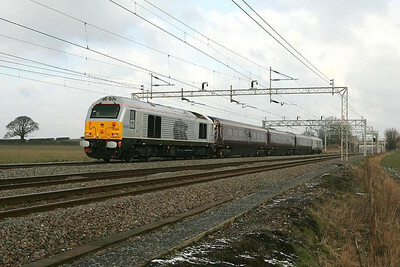 67029 passes Dordon Hall Farm on 22/02/2005 working 1Z05 0823 London Euston-Lichfield Trent Valley. 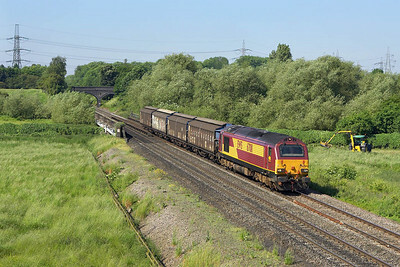 67020 passes Rowington whilst working 5X61 1254 MO Q Birkenhead-Eastleigh Works has 507033 in tow on 27/06/2005. 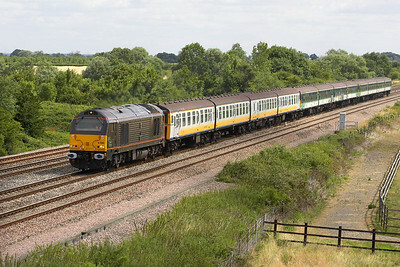 The 507 will undergo refurbishment at the aforementioned Alsthom Works at Eastleigh. 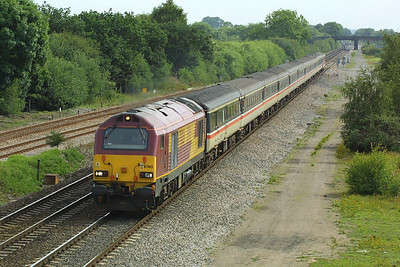 Royal 67005 heads 5Z23 0842 Stewarts Lane-Caerwent at Denchworth on 20/07/2005 conveying Class 421 4-CIG units 1863, 1861 & 1862 for scrap. 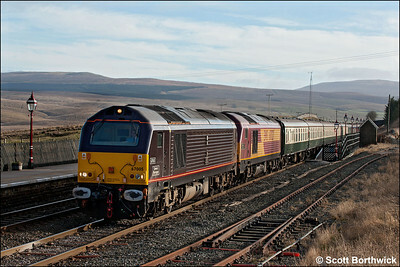 67005 'Queen's Messenger'+67027 'Rising Star' pass through Ribblehead on 21/01/2006 with 1Z27 0543 Bristol Temple Meads-Carlisle, 'The Settle & Carlisle Flyer' operated by Past-Time Railtours. 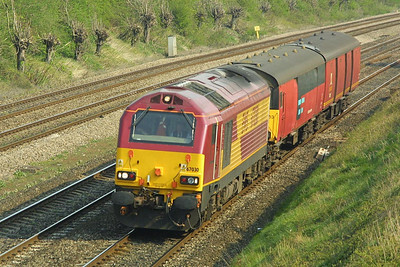 67012 passes Cathiron on 10/05/2006 with 6X16 1431 Wembley EFOC-Longsight TMD delivering 185115 from Siemens Transportation, Germany. 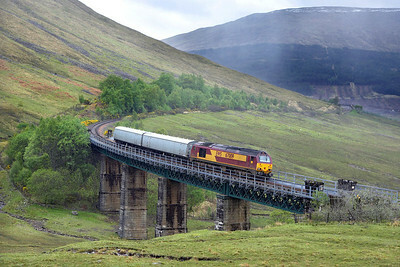 67009 crosses the southern viaduct in the Horse Shoe Curve during yet another torrential downpour on 25/06/2006 whilst working 5Z06 0647 Mossend Yard-Rannoch driver training in readiness of the class taking over from class 37's on the sleepers in June. 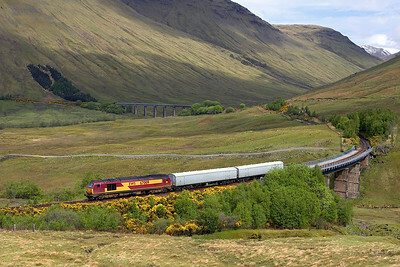 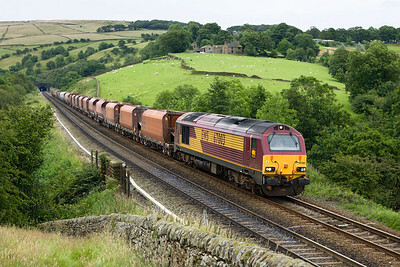 67009 runs off the southern viaduct in the Horse Shoe Curve on 25/06/2006 whilst working 5Z07 1112 Rannoch-Mossend Yard driver training run. 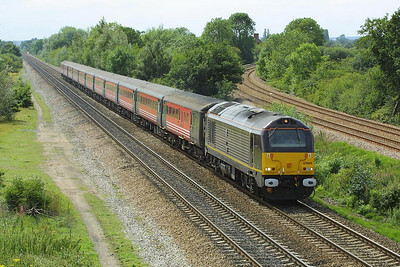 67011 passes Lea Marston on 09/06/2006 with 6G36 0909 Bescot Yard-Birch Coppice. 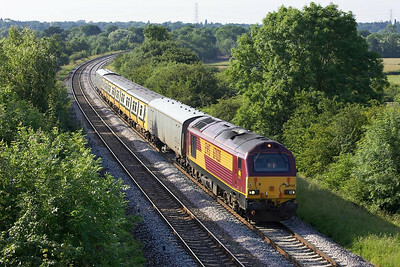 67001 hauls 6G42 1123 Birch Coppice-Bescot Yard through Whitacre Junction on 25/07/2006. 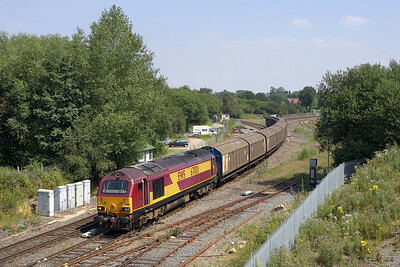 67003 passes Wash whilst working 6M87 1530 Toton-Peak Forest on 28/07/2007.